Reflections and Ruminations: A note to the celebrant of my funeral Mass. A note to the celebrant of my funeral Mass. As a priest, I have presided over many funeral Masses and services. I have also been to many more of them, presided by other priests as well. The beauty of the liturgy is found among other things, in its timelessness and consistency. Priests are not free to change, augment, add or remove what are the essentials. Generally, and for the most part, priests “read the black and do the red”, as liturgists are wont to say. However, there are still many celebrants who are keen to take liberties at making the Mass, especially at Weddings and Funerals, something other than what it should be. Being a concelebrant at such liturgies is often a test of real Christian charity, especially when one chooses to withhold one’s comments. So, I have decided that somewhere in my storehouse of notes and instructions, I would want to make it clear that there are in fact certain things that I would not want to happen or said at my funeral Mass. Providentially, I have the platform of my weekly blog to “put it out there” for not just the celebrant of my funeral Mass, but also for those who happen to read my weekly spiritual musings. Lest this be seen as an act of vanity, I assure you, dear reader, that it is not. 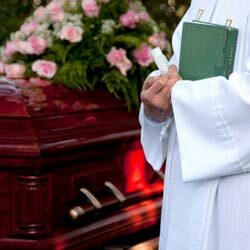 It has a much larger hoped for effect – that as you read this blog entry, you too will now become clear and aware of what a funeral Mass should be, helping you to know how a well catechized Catholic ought to be praying at such gatherings. Hopefully, it will also help you to leave similar instructions to your kith and kin when it comes time for your own funeral. 1. All Masses are about Jesus. Don’t make it about me. We can easily think that funeral Masses are about the person lying in the casket. This is robbing God of his rightful thunder. All Masses are a celebration of the Paschal Mystery. This is the passion, death, resurrection and ascension of Jesus Christ and how this has saved the world. Making it about any other person or any other event detracts from the essence of the Eucharist. For that matter, wedding Masses too when badly celebrated denigrate something that is meant to be divine and centered on God and his mercy, diluted to become an event which is wrongly understood as the Bride and Groom’s day. The focus needs to be taken out of the person and be given to God as he truly deserves. 2. My funeral is not my canonization. If at all, leave that to the proper authorities. I have been to too many funerals where the well-meaning celebrant declares with disturbing authority that the person in the casket is now in heaven. No one but the Congregation for the Cause of Canonization has that authority. And in all likelihood, it will be many many years, even decades or centuries before this would be official. To hear the priest say that ‘grandma is now in heaven’ is at best platitudinous at such times, but they are just that – platitudes. There is no certainty that the person is not in need of purgatory and its purification. Besides, we as Church cannot and must not downplay or ignore the doctrine of purgatory. Understood well, this doctrine is a most merciful teaching and too few are thankful for it. 3. Eulogies really have no place in any Catholic funeral liturgy. The reason for this is very much based on the understanding that the Eucharist is never about us but God and the sacrifice of Jesus. It is also for this reason that any applause for human efforts and skills for a choir that sings at Mass denigrates the celebration into a stage where the human person and talent displayed is the focus. 4. Move the eulogizing to its proper place – at wakes. I may have seemed cold and insensitive to have removed anything about the person from the funeral Mass, but this doesn’t mean that nothing at all should be said about the deceased. Much can and ought to be said and shared about the person’s life during the nights and days of the wake services held either at the funeral parlour or the homes of the deceased. The setting and ambience of these places make it much more appropriate to speak with candor and fondness. Sometimes, the language used in churches where eulogies have been slipped in were not only inappropriate but offensive as well. Some funeral liturgies have seen secular music being played within the walls of the church. As much as “Sweet Child O’ Mine” was the favourite of the deceased, or that “If we hold on together” brings back tender memories of times shared with the deceased, it has to be said that Guns N’ Roses and Diana Ross really do not have a place in the Liturgy. This reflection is not original. I came across something similar which I thought was genius by an American blogger named Chad Bird some time back, who by the way is not a Catholic. His blog entry seemed to point out that such funeral gaffes are also committed in his church, and similar umbrage is taken by members of their flock when their pastors hold funeral services. If I may make a point of observation, this kind of liturgical faux pas most likely stems from the narrative that most people have in life – that our lives are about us. Take this to its natural end, it will only end up making our deaths and our salvation are also all about us. This could be the last thing that we need to fight to overcome till our last breath. Literally. Besides claiming people are in heaven, some priests also have the bad habit of claiming some people will go to Hell for sure. Nobody except God can pronounce judgment on an individual soul. We Catholics set the bar too low for ourselves. The goal should be to strive and become Saints now, to strive to reach Union with God and experience a little taste of heaven while still alive. What happens after death is really out of our control and we just have to entrust our soul or the souls of our love ones to God's mercy. Getting fixated on where our soul or the souls of our love ones are going is missing the point. The Church and her people are not perfect and it never will be until Christ comes again. The things you mentioned used to bother me a lot but not anymore. I'd like to think now Jesus is fine with the 99 sheep in his sheepfold playing silly songs in church, having big egos, bickering among themselves, arguing about orthodoxy,even sinning as long they remain in his sheepfold and maintain a relationship with him, however superficial. Jesus can can work miracles in individual souls in His time. What hurts Him the most are the ones that leave the sheepfold, the ones that break off the relationship with Him totally. People are leaving the Church.That is a much bigger problem to address than the ones still in Church clowning around. Your four points are spot on. The priest's sole focus should be on the salvation of souls. Perhaps we should go back to the old mass procedure where the priest faces the altar just as the congregation does.